Amber Rings There are 8 products. 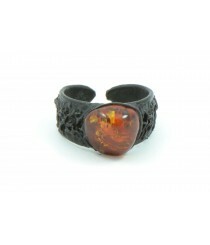 In this category you can find different styles of Baltic Amber Rings. They come in various colors like green, cognac, cherry, dark green, honey and many others. Some jewelry in this catalog also combine Silver Sterling 925 or leather. Most of our rings are strung on elastic bands so they can fit various sizes. 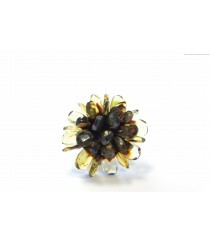 Due to the fact all Amber rings are handmade they might be a bit different in their appearance. 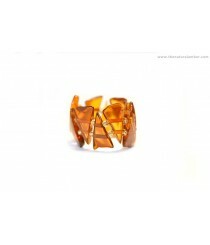 We only use genuine Amber pieces, that comes from Baltic Sea, when making them. These rings can match well with other Amber jewelry like bracelets, necklaces, or pendants that will create beautiful looking Jewelry sets. 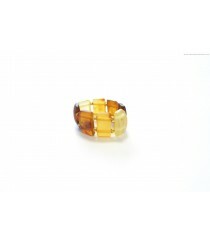 Amber rings can be an excellent gift for any female. 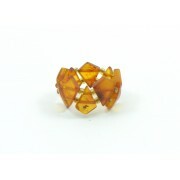 Product ID: R111; Short Description: Unpolished Multi Amber Ring Strung on Elastic Bands; Amber: Raw (Unpolished); Color: Multi. 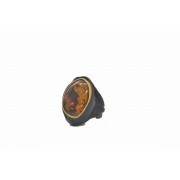 Product ID: R115; Short Description: Cognac Amber Ring with Leather; Length: ~3 X 2 cm (1 X 0.8 inches); Weight: ~ 3 g; Amber: Polished; Colors: R115-1 Cognac Amber and Dark Leather; R115-2 Cognac Amber and White Leather; R115-3 Cognac Amber and Bordo Leather.